Note: To record or upload a new prompt, click the + button. The Create Prompt dialog box opens. 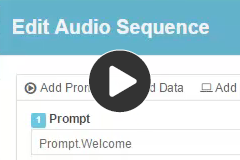 For more information on recording prompts, see the Suggested content. シーケンス ビルダーの [式] ボックスに以下を入力します： ToAudioLastName(“Smith”). Note: Some languages use a grammatical gender system that classifies nouns as being feminine, masculine, neuter, or common. In addition, other part of speech, such as articles, must also agree with the language gender. For information about configuring parameters that specify how TTS plays a supported language’s gender-specific content back to the caller at runtime, see the Suggested content.